Recession, economic downturn, financial instability – you’ve heard it played out so many times, I’ve often wondered if it’ll ever end! Well, in times of strife and gloom, I think everyone can find some respite in a comforting and tasty meal – on the cheap, of course. Join me as I rustle up a quick and nutritious meal that’s easy on the pocket but filling on the stomach. For those of us who are time poor (I hear a resounding yes from everyone!) this is a great recipe to whack together after a long day at work or when you’ve got hungry mouths to feed and what’s more, it costs less than a fiver! 1) Start by bringing a large pot of water to the boil and then add the entire packet of spaghetti; cook according to the instructions on the packet. 2) While the pasta is cooking, chop the tomatoes into halves and chop the leek and add to a pan with the oil and cook until they begin to soften. 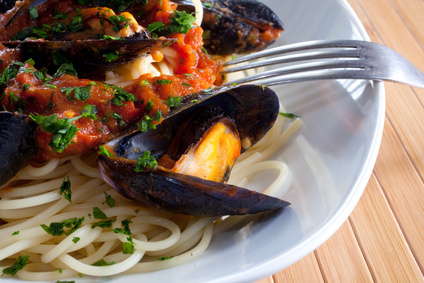 3) Empty the water from the pasta and add the mussels and the tomatoes and leeks. 4) Crush the garlic and add to the pasta with the salt and pepper along with a splash of olive oil. Cook the pasta for 2 minutes. 5) Garnish with the chives and serve immediately. Do you Have a Recession Busting Budget Recipe? If you have a recipe that you’d like to share, please send it to us by using our contact form on this link. If we like the recipe we’ll add it to our Recession Busting Budget Recipe Resource and credit it to your name.